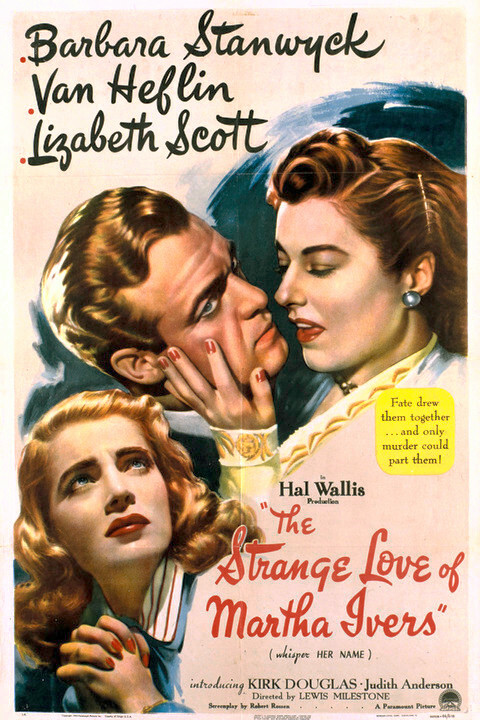 The Strange Love of Martha Ivers is a black-and-white film noir released in the United States in 1946, starring Barbara Stanwyck, Van Heflin, Lizabeth Scott and featuring Kirk Douglas in his film debut. The movie is based on the short story "Love Lies Bleeding" by playwright John Patrick � using the pseudonym Jack Patrick � and was produced by Hal B. Wallis. The film was directed by Lewis Milestone from a screenplay written by Robert Rossen and Robert Riskin, who was not credited. The film was entered into the 1947 Cannes Film Festival. In 1974, it fell into the public domain in the United States due to the copyright owner's failure to renew the copyright registration in the 28th year after publication.